Analyzing the planets of our solar system as well as the wider universe, this definitive reference provides an unparalleled understanding of all aspects of astronomy. From straightforward questions regarding the distance of stars and Galileo’s discoveries to theories on the possible expansion of the universe, this examination is sure to appeal to both amateur astronomers and space buffs. Beautifully photographed and illustrated with detailed diagrams, this is a highly authoritative and fascinating guide to one of the most exciting areas of scientific research. – From straightforward facts such as ‘How far away are stars?’, and ‘What did Galileo see through his telescope?’ to broader questions such as ‘Is there an edge to the universe?’ and ‘How did the universe begin’?, this exciting new book will appeal to all levels of interest. Concepts are supported with diagrams and impressive colour photography. A highly authoritative and fascinating guide to one of the most exciting areas of scientific research. 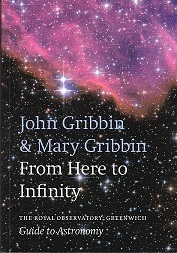 ‘From here to Infinity’ is endorsed by the global reputation of the historic home of astronomy – the Royal Observatory of Greenwich.